Miami has never been short on hot hotels. From beautiful-people-watching at sparkling pools to niche budget options to chic boutiques, there’s a range of accommodations for everyone looking to bask in the dazzling Miami heat. From the folks at the hip SIXTY Hotels, these new, laid-back beachfront accommodations include 250 guest rooms designed with mid-century flourishes and, as its name suggests, nautical touches like vintage steamer trunk minibars and sisal rugs. A heated saltwater pool lets you relax before you head to chef Alex Guarnaschelli’s buzzy Driftwood Room. There’s nothing better than arriving in the lobby of the eco-chic 1 Hotel with its living green wall and farm stand offering fresh produce. The calming aesthetic of the 426 rooms also have hemp beds with 100 percent cotton sheets and yoga mats for some stretching. A retreat to the rooftop pool lends sweeping views of the sea as you sip a margarita. Besides its mod 294 rooms dressed with white and tan accents and oceanic landscape photos, this sophisticated Ian Schrager–conceived hotel (in collaboration with Marriott) also has two Jean-Georges Vongerichten restaurants, an ice skating rink, outdoor movie theatre, bowling alley and two swimming pools. Let’s just say, you won’t be short on activities. Steps away from South Beach, this Spanish-style boutique hotel showcases Mediterranean architecture coupled with 49 bright-and-airy rooms (including 20 suites) outfitted in handsome Spanish tile floors, carved beds and pillow-top mattresses dressed with Frette linens and stunning handmade Argentinian bed throws. The chic, mid-century vibes of Thompson Miami Beach are playful, bright and decked out in shades of yellow and turquoise. Head straight for the pool, which backs into the ocean and procure a tented cabana as you sip a cold drink with an umbrella. Later, pop into the chic 1930s House for some tapas. The newest reentry to Miami’s vast hotel scene is this enchanting oceanfront spread under the astute design direction of filmmaker Baz Lurhmann. Expect a plush palette of hues and textures like coral lamps, pops of red velvet and animal-print ottomans spread among the impeccable 111 guest suites. Housed in a refurbished 1950s motel, this 235-room hotel includes signature platform beds, roomy walk-in showers, toiletries by Bliss Spa and black-out curtains for undisturbed sleeping conditions. In the morning, retreat to the ground-level pool with loungers, foosball tables and, in true Miami fashion, a fully stocked bar. Located in a cool 1920s white-on-white art deco building, 74 light-filled rooms with contemporary splashes of gray tones and vintage furnishings come compliments of Italian designer Paola Navone. The goal here is wellness, so take a day spa with the rooftop hydrotherapy pool or book one of the signature COMO treatments. 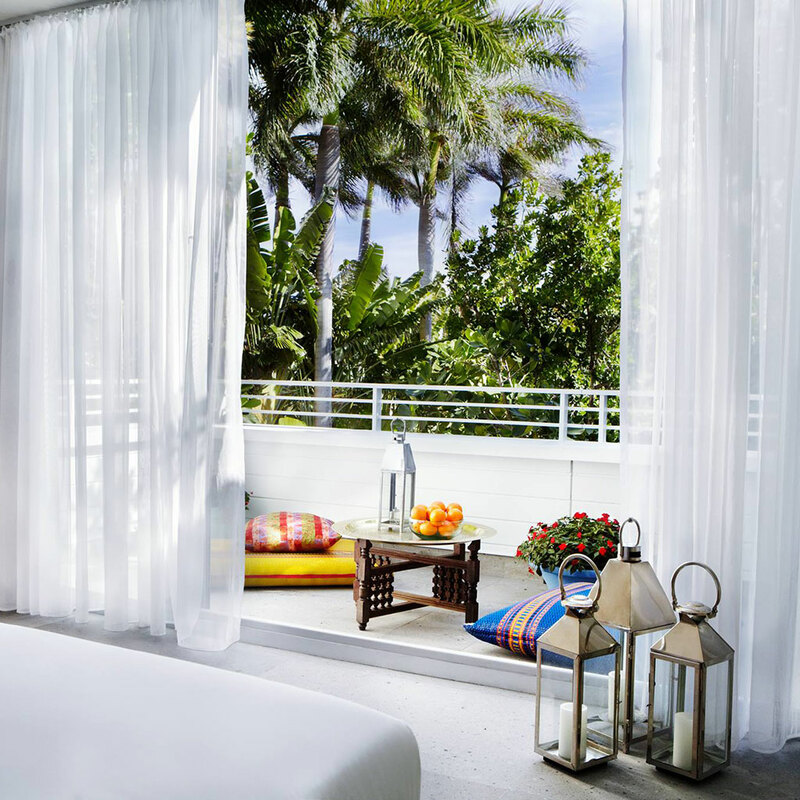 The fashion-forward Shore Club's 308 spacious rooms are dressed in white on white with pops of color, soft bedding and generous bathrooms stocked with Malin + Goetz products whith suites that look out at the clear blue Atlantic waters. In the day, the pool is the place to be seen with DJ's spinning the tunes and in the evenings, the nightlife kicks up in the poolside lounge, so don't plan on early slumber. In the mornings, retreat to the spa for some rest before you play.